You are here: Body Imaging/Cody J. Boyce, M.D. Received his medical degree from University of Wisconsin School of Medicine and Public Health in Madison, Wisconsin. He completed a Diagnostic Radiology Residency at the University of Wisconsin Hospital and Clinics in Madison, Wisconsin. Dr. Boyce remained in Madison at UWHC for a fellowship in Abdominal/Body Imaging. 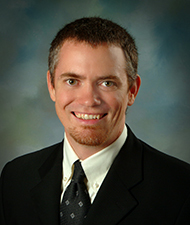 Among his sub-specialty training and skills, Dr. Boyce is proficient in the use of; CT, MRI and Ultrasound with an emphasis on abdominal and pelvic pathology. In addition to spending time with his family, his recreational pursuits include skiing, running, and backpacking.